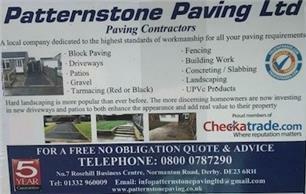 Patternstone Paving are a well established monoblock and paving specialists, constructing high quality driveways, patios, paving areas and landscaping to our customers specifications and requirements. We can provide an extensive range of paving to suit your every need. Based in Derby, we serve all areas of Nottinghamshire, Derbyshire and Leicestershire. Staffordshire. Specialising in a wide variety of driveways and block paving work, our experienced and professional staff can offer you free impartial advice on all your block paving driveway requirements. With years of experience, you can be confident of our quality and reliability. When you place an order with us for a driveway, patio or other hard landscaping project, you will receive an installation of the highest quality fitted by craftsmen whose workmanship and integrity is second to none. Our surveyors are experienced and trained to create driveway, patio and garden areas which meet your requirements. They can advise on colour schemes, patterns, layout and take care of the technical side regarding drainage and water run off. There is a comprehensive range of colours, styles and materials available. Patternstone Paving guarantees all installations. We offer a fair price for a top quality installation. We will take you through each stage from planning and design to installation and be on hand to answer any questions you may have. Please visit our website for further comprehensive information. Please contact us today to discuss your requirements or for free friendly, professional and helpful advice. We look forward to hearing from you . Alfreton, Belper, Derby, Derbyshire , Leicester , Nottingham , Staffordshire.